My main palette as of April 27, 2018 — I change it around every once in a while and will update this post when I do! It holds 21 colors. I use tube paints from various manufacturers or paints that I made myself and put them in pans. More on the specific paints below. I use this small metal palette box from Case For Making, similar ones here from Blue Rooster and here from Amazon. I like this palette from Case For Making because it’s easy to take with me and the lid that flap that flips out with the mixing wells sits on the work surface and it has 6 wells on that side for plenty of mixing areas. I don’t like palettes with flaps that stick out in the air ha! I’ve had this little palette for about 3 years now and it’s been everywhere with me, so I’d say it’s pretty durable. From looking at the photos, I’d guess that the Blue Rooster one is the most similar. If anyone can confirm I’d love to hear. I get the pans from Kremer and Blue Rooster. One note — the pans that come with the Meeden palettes have thick walls that bug me hahaha! And I don’t like the translucent ones. So I prefer to get my pans separately from Kremer or Blue Rooster. I write the names and makers on the left sides of the pans with a sharpie so that I know what’s what. Full disclosure: I wanted to mention that I do have this BIG palette but I keep it in a drawer haha! It takes up too much room on my desk and I had trouble remembering what the colors were without checking the side of the pan and I didn’t remember the properties — is that color granulating? Staining? I just couldn’t keep it all in mind and it really interrupted my flow. 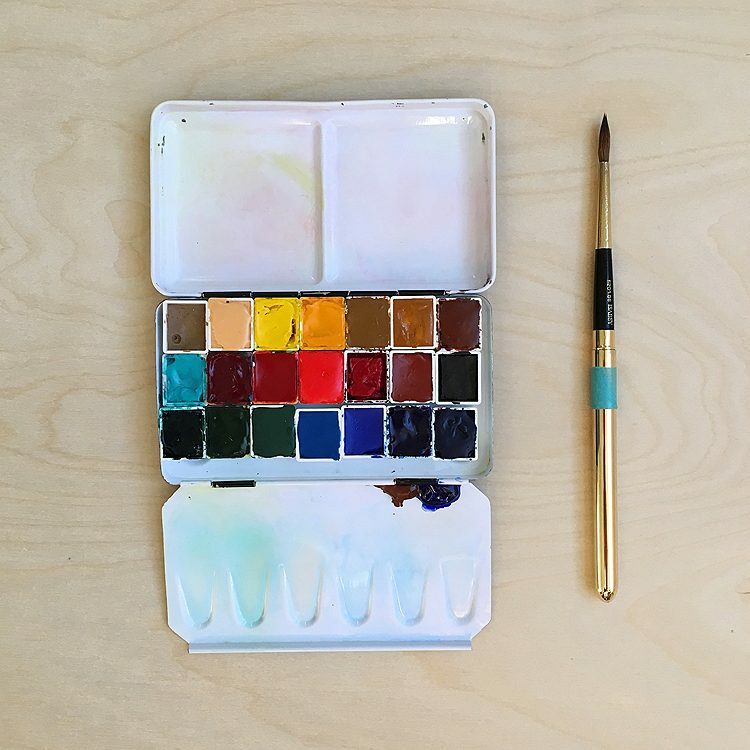 With this small palette I can keep everything in my brain and I’ve gotten so used to it that I can paint with it out in the field at dusk or on long flights when the cabin lights are dim. I now use the big guy for storing filled pans that are out of rotation in my main palette. 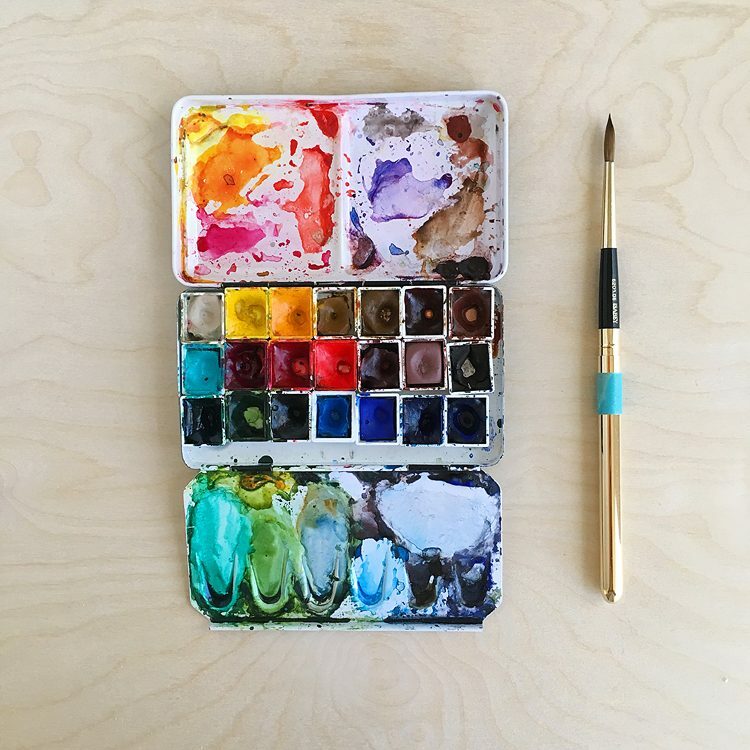 I love being able to grab this palette and toss it in a bag to take with me — I take it on short hikes or on trips all the time and since it’s the one that I use at my desk it’s always ready to roll. I also have some small but mighty palettes that I’ll post about soon! Okay so now on to the paints! I chose these colors for what I paint the most, which is mostly Texas wildflowers and landscapes. Although Texas is a big state this palette does the trick, from here in Central Texas to the desert and mountains of West Texas, the prairies and all the way out to the coast. I added purchasing links to these where possible: AZ = Amazon and and EH = Ellen Hutson. These are referral links so if you make a purchase by clicking the link I’ll receive a small commission at no charge to you — thank you! I also have 2 blobs of burnt sienna and ultramarine blue down in the mixing areas so that I can quickly mix up a gray or use them for adding to other mixes. When colors get used up I refresh the pans by squeezing out more color from the tubes. Every once in while I’ll give the palette a good cleaning — I’ve found that magic erasers are great for removing some of the stains — but that darn phthalo blue doesn’t budge. It’s so pretty tho it’s a keeper. Have to add that the magic eraser also helps prep new palettes so that paint doesn’t bead up on them. My palette in January 2018 — you can definitely tell which colors I use the most! :) Find out about the brush shown in the photo here in this post. All clean before going on our big adventure! You can see where the phthalos stain the palette but I don’t mind — I actually kinda like it. Those two blobs down in the mixing area are burnt sienna and ultramarine blue. I mix those two together by running my brush back and forth over them and I let them run down the side into the little mixing well. Sometimes if I remember I put a blob of hyl in my green mixing area but I forgot this time. Jane Blundell – her ultimate mixing palette rocks. I got her ebook and worked my way through it, it was so helpful. She also has more palette lists on her blog. 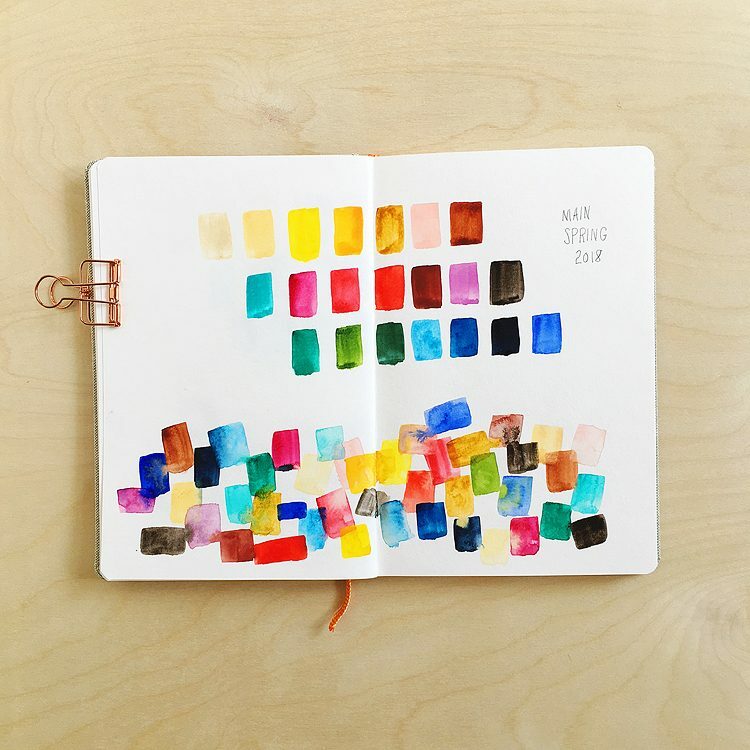 Liz Steel – love how her palette has both full and half pans — I don’t know why I never thought of that! Also love her article about putting together a palette for a big trip here. Handprint by Bruce MacEvoy — he has so much good info! Seriously good. Before purchasing a new color I always check his site first.